If you're just getting here, check out Part 1 for an explanation of the experiment. 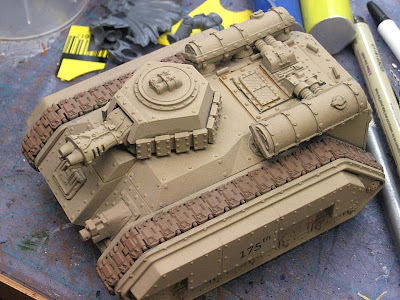 Prior to using the powders to weather the tanks, I did a few things to them in preparation. 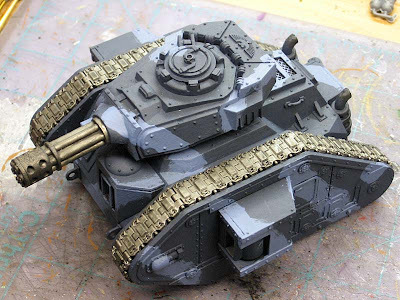 Step one was to apply an overall thinned wash on the model followed by a light drybrush highlight along the edges of the tank. This brought out the texture on the tank. Then I went in and added the soot stains to the ends of barrels and picked out some small details on the models like vent screens, iconography, etc. 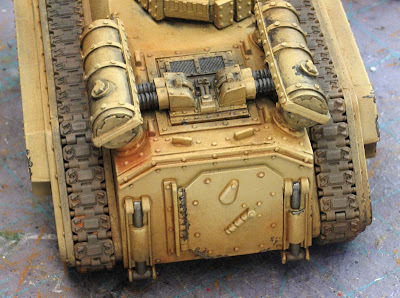 Nothing crazy, just a detail here and there to break up the mass of armour plating. I also made it a point to add spill stains and chipped armour along some edges. Then it was powder time. I made sure I had all my powders out and ready to go so I could jump from one to another without having to stop and open a jar and so on. This meant I could keep working until I had the effect I wanted on the model. I'd like to add one more thing to all of this. 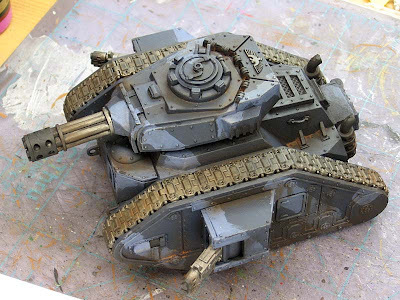 Both models were given a light spray with Testors Dull Cote after being weathered. This was for two reasons. To protect the model and "seal" the powders so they don't come off and could be handled. I will say that coating them toned down the effect of the powder, but this was probably a good thing for me since I most likely went a bit too far initially. All in all, a huge success for me. I know for sure that I'll be adding this little trick to my painting from here on out. I'd like to thank misterjustin for his help on this as well. He took the time to answer all of my emails even when I asked the same question for the tenth time or simply told him I was going to do what I wanted despite his advice. So if you have the means and you're looking to add an incredible realism to your models with just a little bit of effort, powders are the way to go. Jack: Thanks, they have taught me a ton about weathering a model and branching out into other techniques and materials instead of just paint. I'm working on more to see what I can do about refining my results. They both look good, though the effect on the Hellhound is a lot more striking. Do you have any shots of after your washing/drybrushing/etc. but pre-powder? 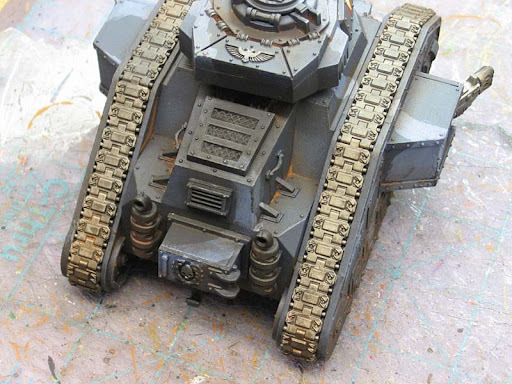 sonsoftaurus: I do, I am planning on doing another tank and breaking down the process into actual steps to show the progress. Between these before/after shots of yours, and MisterJustin's video tutorials, I think I'm pretty much sold on the idea of powders now. Looks super, Ron. 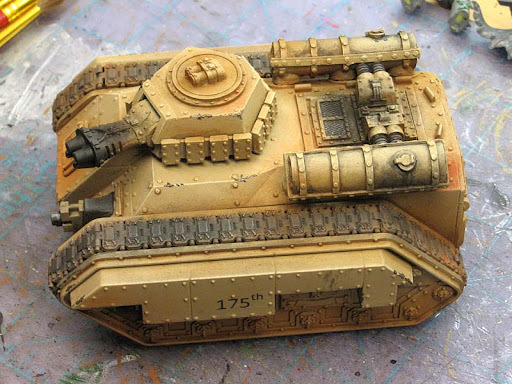 I agree that the weathering looks more effective on a single color as opposed to camo. Can't wait until you do the break down on your steps. Well crap - that's it. I'm sold on weathering powders. Going to place my order today. Ron, I'm glad that you've posted the Hellhound now because you can see people other than me saying, "WOW!" Deadmeat: It's in the works now. I wanted to take what I had here and maybe go another step in detailing while still trying to keep it simple. misterjustin: Thanks. They are my initial attempts. I'm hoping I can fine tune my skills (like using GW washes) as I get more practice in with them. I've been using a cheaters method. Flory models produce a ready mixed weathering mix in a variety of colours. On the tanks in my blog I've used the sand coloured one to give me a quick weathering. The premise is simple, you can apply the wash anywhere you want, when it dries, teh water evaporates and leaves behind the powders which you can then seal in. However, because it is clay (and water) based you can easily manipulate the dry material using a moist tissue, taking some off, or adding more as you see fit. I've found it incredibly quick and easy to use... and not nearly as messy as the powders! You can mix different colours and shades together if you want to, though for my purposes I stuck with one (because I need to get things done for a tourney). I've found that the sand wash seems to work really well against a green colour and would strongly recommend it for any Cadian IG armies!!! oink: It's not cheating if it works. I'm going to have to look them up. is the site. Check out their "weathering washes". ADditionally, you should be able to find some videos of using them on YouTube. The only trouble I've found is that they can be difficult to manipulate for particular areas. A liquid likes to move around more than powders!